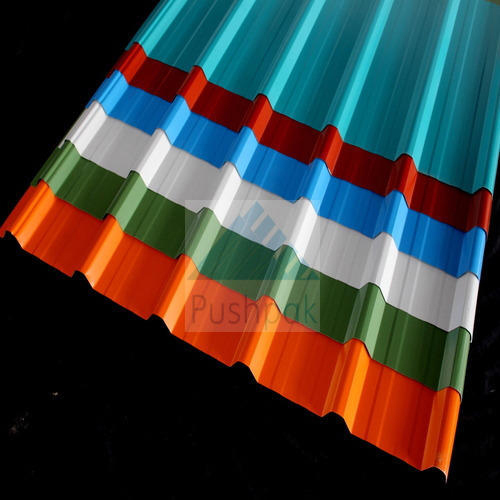 We are engaged in providing high grade Color Coated Roofing Sheets that are built from copper, stainless steel, aluminum and tin metals. This sheet has prime and even color coating all over its surface. Here, the thickness of coating depends on the weather conditions and on the usage. The sheets are durable as both sides of the sheet are galvanized and coated with a standard alkali wash coat. Further, the sheet holds high resistance strength against breakage and weatherly damage. Our sheets can continuously bear the temperature between 40 and 80 degree Celsius. The sheets are built from polyvinyl chloride based thermoplastic resins that create short molecular chains, thus providing excellent resistance against UV rays. Color : poppy red, merlin gray, blue, olive green or light gray.